Breandán O’Scanaill traces the flight of Alcock and Brown and outlines the conditions prevailing in Clifden at the time. On June 15th 1919, Alcock and Brown crash landed their Vickers Vimy aircraft in Derrygimla Bog just south of Clifden, after their harrowing sixteen hour flight from St. John’s, Newfoundland. An exciting new link had been forged between the old and the new world. These two gallant RAF airmen, Capt. John Alcock and Lieut. Arthur Whitten-Brown, had set off from St. John’s the day before, Saturday June 14th in a two-seater bi-plane. This aircraft, a Vickers Vimy, had been designed to fly long range bombing missions, and a lot of modifications were needed for the attempt of the transatlantic flight, including doubling the flight endurance to twenty hours. Fuel capacity had to be increased to 865 gallons. It was powered by two Rolls-Royce Eagle VIII engines of 360 horse power each. After test flights in England the aircraft was dismantled and shipped to St. John’s, arriving there on May 26th. Then began the task of reassembly, which was hampered by bad weather, but once completed a number of test flights took place and the craft was declared ready to make the awesome journey. The start of the flight was relatively trouble-free, apart from a prolonged take-off, but soon they ran into problems. Fog and cloud reduced visibility and Brown needed clear skies to navigate reliably. Still they pressed on. Next, the radio failed, and the starboard exhaust and silencer disintegrated making conversation impossible. Weather conditions were also getting worse and the craft was thrown about. Battered by hail, both men feared that the aircraft’s fabric would be torn. Alcock lost his bearings at one stage and the plane went into a spin and fell 4,000ft Struggling to regain control, he succeeded in doing so just 50ft from the sea! As the rain turned to snow, the controls began to freeze up. On six occasions, Brown had to leave the cockpit and manually clear ice from critical parts of the aircraft. Deciding to land in County Galway, they turned slightly south of their course and made landfall just over Turk and Turbot islands at the entrance of Clifden Bay, flying over the Marconi Wireless Station, where they tried unsuccessfully to attract attention. They then headed for Clifden where they circled around the town, observed by quite a number of townspeople. Hoping to find a suitable landing site they returned to the Marconi Station and understandably mistook a stretch of bog for a smooth green landing strip. 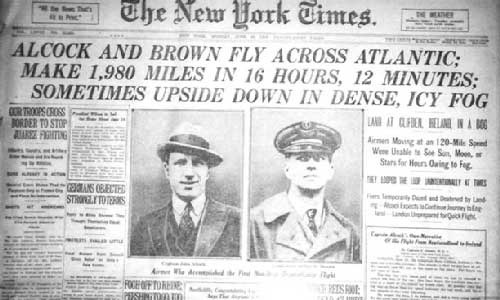 Although the nose of the plane sunk into the bog neither Alcock nor Brown suffered serious injury and their place in aviation history was secured. A cheque for £10,000, being the prize offered by THE DAILY MAIL, also awaited them in London. The very spot where they landed had played its own part in the pioneering of intercontinental communications, for here on October 17th 1907, the first commercial wireless messages were transmitted and received. The Marconi Wireless Station had been set up on this exposed site on the west coast of Ireland in 1905. It had taken two years to build and was a major undertaking. As well as building the various structures needed to provide accommodation for the workers, they had to build a generating plant which provided the power needed to run the station and a condenser house which was 350ft long by 75ft wide. The aerial for the transmitter was made up of eight wooden masts each approx. 310ft high on which the wires were suspended. They also built a light railway which was used to carry supplies from the main road at Ballinaboy, as well as transporting turf from the surrounding bogs. This turf was used to fire the six steam engines which produced the power. There was a permanent staff of around one hundred and fifty and part time staff, mainly turf cutters, of around one hundred and forty. Wages were high and Clifden benefited from this. The capital of Connemara had come a long way since the bad old days of the famine times, the large scale emigration, the religious agitations and the land war. Clifden reflected this wealth with a range of shops and hotels, which were not to be found in other parts of the country. We also find trades of many kinds listed in the census forms of the time such as, shoe and boot makers, fishmongers, coopers, blacksmiths, tailors, dress-makers, coach-makers, butchers, bakers, wool-weavers, boat makers and masons. These show that the area, as well as being self-sufficient, had a good enough population and employment to merit that number of trades. Of course the fact that Clifden had a main link via the railway to Galway City and the rest of Ireland also played a major part in the general prosperity of the town and region. The railway, opened in 1985, was used to carry people as well as produce to and from the area. It witnessed the usual emigration, as well as people going to war and people coming back. It also witnessed the growing tourist trade, and in no small way helped this industry get off the ground in the area. Hunters and fishermen came here in growing numbers and this gave rise to a number of hotels and lodging houses. Tourism also gave employment to car owners and drivers, some private and some owned by the railway company. Many of the employees of the railway lived in Clifden, and again from the census we find evidence of train drivers, guards and porters. The structure of the town has not changed much since it was founded – the streets following the same pattern, the town dominated by the two churches, the Church of Ireland now smaller than in previous times. The square had its ‘crane’ and weight house both now gone. We no longer have the jail, poor house or fever hospital but the jail can still be seen in a very ruinous state. For the people living around Clifden, farming and fishing was their livelihood. The ground had for generations been intensely cultivated. The evidence of this cultivation can be seen by the number of ‘lazy beds’ in many places around about. These ‘lazy beds’ were ideal for conditions in Connemara because as they were raised, the water drained off easily but equally they could trap the heat of whatever sunshine was available. They were fertilised each year with seaweed and farmyard manure. Vegetables and cereals, particularly potatoes and oats were important crops. Cattle, sheep, pigs and poultry were also important and on market days, people brought these products to sell. Fish would also be for sale at these markets, a good amount of which would be brought by people from the islands, Inish Turbot and Turk who would row their currachs to Clifden harbour. Life was very difficult for a large section of the population and emigration was the only option open to many of them. Alcock and Brown left Clifden on the afternoon of Sunday 15th June, heroes to so many people for what they had achieved. On their triumphant journey from Derrygimla, through Clifden, Galway, Dublin and on to London they signed autographs for countless numbers of people. Later in London they received the DAILY MAIL and other prize money totaling £13,000 and were knighted by King George, but no matter what honours were given them I am sure it was hard to surpass the excitement and relief they must have felt when the spectacular landscape of Clifden and its environs first came into view on that June morning in 1919. I remember vividly the story of this landing told by my grandmother who was there to witness it as a young girl before emigrating to the U.S. in 1920 after her mom passed. My wife and I are finally able to make the trip over in May to explore the land of my ancestors. There is so much we are hopeful to discover and the site of the Alcock and Brown landing is certainly among them. Make sure to look me up when you get to Clifden. I am involved in a project researching the Marconi and A&B stories. Will do Shane. We expect to arrive in Clifden around the 23rd of May. Look forward to meeting you. My Great Grandfather Michael Manning was cutting turf when the plane landed. He was one of the 1st people to arrive at the site. We are currently looking for documentation to support this. My family and I who live in the UK have just spent a week in Connemara. It was great to be able to show my 7 year old and my 5 year old twins a part of their family history.